The first weekend of December, MM participates with his Boy Scout troop in the annual lighting of memorial luminaria at Antietam Battlefield near Sharpsburg, Maryland. It is an extremely moving event. If any of you live in the area I urge you to check it out. It is always held the first weekend of December. This year, MM was the event leader and as such was in charge of arriving at the campsite in advance on Friday night and providing a welcome dinner. Chili and cornbread, warm and waiting, were enthusiastically downed by the scouts after they set up camp. We made the chili the night before, and I suggest you do the same. It is fine to eat the day you make it, but, as with other stew-type dishes, the flavors meld and develop with a night of rest. The Boy Scouts are always looking to keep their costs down. So we went to our local supermarket and used their grocery brand products: beans, chili powder, grated cheese, meat. Just days before we made this chili, our friend Ronda came over for dinner. She commented that when she makes her chili she uses both ground meat and meat chunks. I thought that sounded like a nice textural twist, so that’s what we did for this chili. 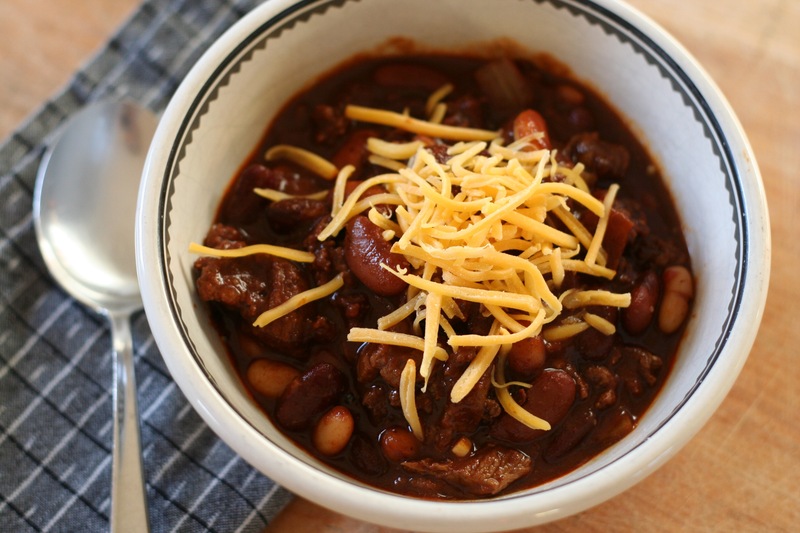 The result: plain, straightforward ingredients that cook up into a deeply flavorful chili. In the photo above, you can see both the ground meat and whole chunks. Note that I used two types of beans: pinto and Great Northern, another little twist to add some depth of flavor, texture, and visual contrast. Feel free to use whatever beans are your favorite or that you have on hand. In a large, heavy-bottomed pot, heat the oil over medium heat. Add the cubed chuck in two or three batches. You want to add a single layer of the meat with space between the pieces. Cook the meat, turning frequently, until browned. Remove the browned meat to a bowl and reserve. Continue with the rest of the cubed chuck. When you’ve completed browning all of the chuck, next add the ground meat to the pot and cook, stirring often, until brown. With the browned ground meat in the pan, add the onion and cook until translucent. Next add the garlic and optional jalapeño. Sauté until the garlic is translucent. Add the reserved chuck. Lower the heat and add the chili powder. Stir and sauté for several minutes in order to cook the chili powder. Add the tomatoes and tomato paste. Break the whole tomatoes up with a spoon when they are in the pot. The pieces will break down as the chili cooks. Add a 1/4 cup of water to the tomato paste can. Swirl the water in the can to mix with the paste left in the can. Add the the water to the chili. Add an additional 1/4 cup of water to the chili. Add the cocoa. Stir the chili well to incorporate the paste and cocoa into the chili. Bring to a boil, reduce to a simmer. Simmer for an hour. Add additional water if needed while the chili simmers. Add the beans with their water to the chili. Once again bring the chili to a boil and then return to a simmer. Continue cooking for another 30 minutes. Add the salt and pepper. Check to see the chuck is well cooked. It should be firm but tender. Correct seasoning. Again, this chili improves with age. So I suggest you serve it the following day. We served it with grated cheddar cheese. The scouts love to add cheese to the top, with cornbread on the side. It’s delicious served fireside at a scout campout! 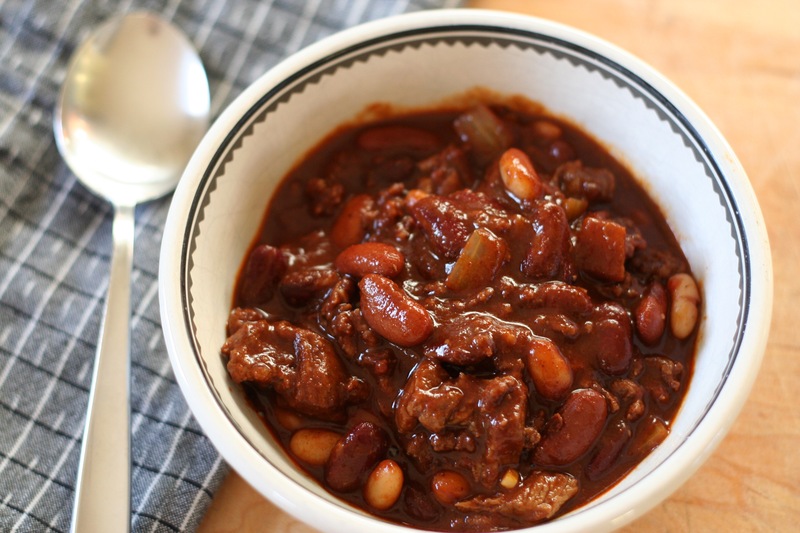 This entry was posted in Mains and tagged beef, can freeze, chili, comfort food, gluten-free, kid favorites, simple supper. Bookmark the permalink.